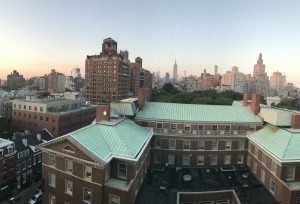 Disclaimer: The views and opinions expressed in this article are those of the individuals polled and do not necessarily reflect the official policy or position of NYU Law students as a collective whole. To Camus, I say: It’s February, and I’m still waiting for my invincible summer. 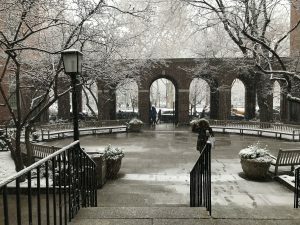 Over the weekend, temperatures dropped around Washington Square Park. The wind was howling at the early morning sunrise, and the air hung about the earth with perceptible stiffness. Hiding in their nestled nooks, the mice that plague the park curled steadfastly in their sodden homes. Not a single bird ventured out into the curling, gelid gusts. The subway rats scuttled into the depths of the underground. And the NYU Law students? Perhaps mystified by the Stygian crypt currently existing outside of my window, I ventured to find out. Below, you’ll find affirmative proof that NYU Law students are more like scuttling, winter-fearing subway rats than they truly let on. Q: Any particular reason why? A: I like the humidity. It keeps life exciting. A: Fall, definitely fall. All of the best foods are only available in fall. A: Pumpkin pie, apple cider, whipped cream, things like that. I mean, they’re technically available, but I wouldn’t speak to anyone who eats pumpkin pie in the summer. A: Winter, because I like curling up by a fireplace with my dogs and family. Q: Do you have access to a fireplace? A: Well, no, but it’s the idea of the fireplace that matters. It’s an ethos. A: I would have to say summer. No, wait, strike that. Fall. A: Fall over summer. No, wait—summer over fall. A: Temperature, leaves changing colors, bittersweet sensation of change, slowly darkening days, stepping on crunchy leaves, anticipation of winter, anticipation of Christmas…. I don’t know, I savor fall more than any other month. How do you feel about this winter? A: Not bad, it’s really not so bad. Q: Do you find yourself going outside as much as you normally would? A: It’s awful. What kind of coat can you wear in this weather? I have no coats sufficient for this winter. Also, the salt that they dump on the sidewalks is ruining all of my boots. It’s awful. A: Today is a perfect example. Warm day, snowed, then got warm, then rained. It was unseasonably cold at New Year;s, then unseasonably warm. Which is interesting, keeps you guessing. But no real satisfying snow since December. Sartorial advice for braving the cold? A: I like scarves. They are really effective at keeping your neck, face, and head warm on really cold days. A: I hate scarves. For whatever reason, whenever I wear a scarf, I feel like I’m choking. A: Shoes with traction, and thick socks. I think there was a study done that said hats and socks are the most important items for keeping warm? A: Thick sweaters and long underwear. A: Oh, gosh, I have no idea. A: [laughs uncomfortably] When I was a kid? A: Probably with my younger siblings a few Christmases ago? They’re young, so they still play in the snow a bunch. A: I haven’t spent enough time in the snow to ever build a snowman…at least, as far as I can remember. A: 2015. Tahoe. It was horribly deformed. 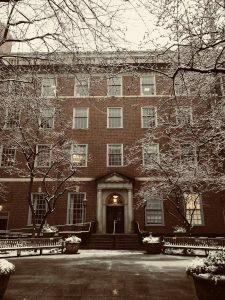 This entry was written by Kiki Hosie '20 and posted on February 06, 2018. Kiki is a 2L from San Francisco, California. She graduated from Cornell University in snowy upstate New York in 2017. Kiki was a double major in comparative literature and performing and media arts, and thus spends much of her free time analyzing obscure German Expressionist films and reading literary theory. She is particularly interested in the intersection of law, media, and consumer culture.